HeatSaver® Thermal Shades offer those responsible for the energy management of large buildings an excellent opportunity to reduce unnecessary energy expenditures, saving both on utility bills and greenhouse gas emissions. Heating oil resources are projected to become increasingly expensive and difficult to obtain. Natural gas seems to be plentiful, but the process of extracting it generates toxic pollution. Options for electricity generation vary from exciting new green technologies to those that are ridiculously polluting. 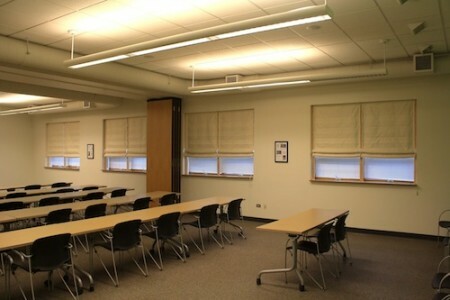 In early 2011 HeatSaver® Thermal Shades were tested for performance at an independent lab in Minnesota. A summary of the results, showing an R-Value of 7.40 when used with double glazed windows and an R-Value of 6.39 with single pane windows can be found here. The tests, the most recent and stringent, cover only conduction losses. Those from convection, infiltration (what residents feel the most) and radiation were not included. Then. 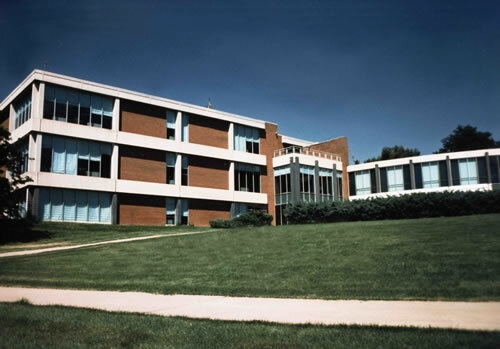 In 1985 we installed 160 shades covering nearly 6,500 square feet of single pane windows in a private university library. At the time the school had 4 utility meters for the entire campus, none of which were dedicated to this building alone. Thus we were not able to acquire accurate onsite information. Yet in 2006, while trying to glean at least some useable data, we made an interesting discovery. The windows, at an R-Value of less than 1, went from being the worst performing part of the building envelope to the best with the addition of HeatSaver® Thermal Shades. It’s simple math. An exterior brick veneer with roughly a 1” dead air space covering concrete block interior walls equals R 3.58. Now. October 10, 2014. Almost three decades later many of the original shades are still in place and working nearly as well as the day they were installed. When we installed 8 shades in the Chicago Center for Green Technology in the summer of 2013 we knew it would be a great HeatSaver® sample for Chicago residents and visitors. What we didn’t realize at the time is just how important this installation could become for researching and defining the impact a well designed, fitted thermal shade can have on a building’s overall performance. We are now conducting tests using Onset sensors and data loggers to more fully understand the contribution our shades can make to a building’s performance. To our knowledge no similar research has been undertaken with the intent of showing the impact a well designed, fitted thermal shade can have. The two pairs of windows being used are roughly 40 feet apart. The shades on the East are permanently deployed, those on the West are permanently raised throughout the test period. 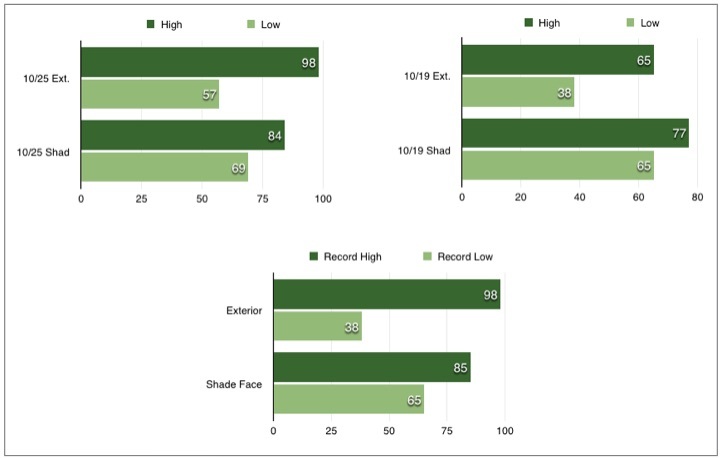 show how HeatSaver® performed during October 2014. Data gathered over many months shows that extreme temperature swings, from both heat gain and heat loss, are continually moderated thus providing energy savings, reduced loads on HVAC equipment and greater comfort. The report for October can be found here. Regular updates showing detailed information and the results, including daily and weekly weather conditions, will be posted on our Library/Resources Page. Although the Center for Green Technology is now closed to the public we continue to collect this valuable information and hope to do so throughout 2015. Proceeding in this manner will enable us to more fully understand how this building is effected by exterior heat gains and losses through the windows and how a well designed, fitted thermal shade can have an impact on building performance. Contact Peter if you would like to arrange a private viewing. We inherited schools that were designed and built during a time when energy was cheap and waste was not an issue. Huge windows were often part of the design. They brought in sunlight and offered views to the playgrounds and neighborhoods beyond. Heating and cooling vents were usually located below the windows, placed there to keep interior temperatures stable, the children comfortable and secure. While many of these schools are still valued parts of our communities and serve our children well, characteristics of that original architecture can give today’s administrators fits when it comes to expenses. The windows that seemed so inviting years ago are now recognized as sink holes into which many budgets disappear. New replacement windows, usually with a 10 to 30 year payback period, don’t always solve the problem either. Heating and cooling vents are still below, directing their expensive conditioned air directly against the glass. Thanks in part to one mother’s vision and determination a different solution has been implemented in a small elementary school in central Wisconsin. 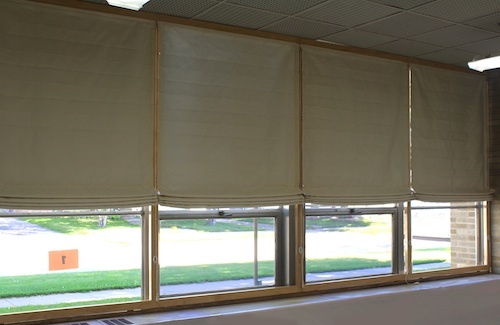 HeatSaver® Thermal Shades have been installed in one classroom as a demonstration project. These few shades offer a different approach and opportunity for energy conservation and savings. The shades provide an R-Value of 6.39, stop the chill of cold air from coming off the windows, and keep the warm air going into the classroom where it will have the greatest benefit. This one wall section now has the highest insulation value of the entire building’s exterior. As you can see, frames were built on which the shades were installed, thus not touching the original windows at all. 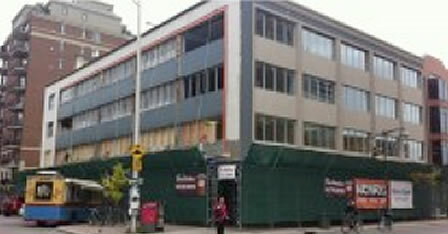 The architectural and structural integrity of the building’s exterior has not been compromised. Thanks also to the Lowe’s Toolbox for Education Grant which made funding for this project possible. This is typical of the architecture we are now responsible for. The buildings we have inherited often have the insidious problem of heating and cooling plants working at odds with one another – at the same time! Offices, classrooms or apartments on the north will be freezing while those on the south will be baking. No one is happy or comfortable, including the Budget Director who has to find a way to pay for rising energy costs. HeatSaver® Thermal Shades can moderate and stabilize interior temperature swings by minimizing the effects of the windows and extending the life span of expensive heating and cooling plants. 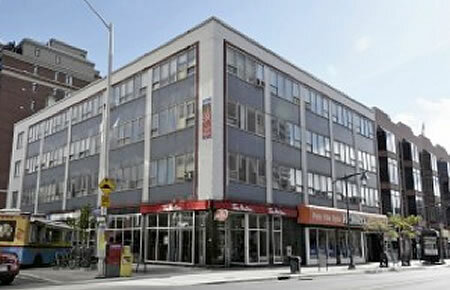 This building was recently rehabbed in Ottawa and of course the old windows were replaced. The walls received spray foam insulation increasing their R-Value to about 38. The new windows are double pane, low-e, greatly increasing their efficiency. Yet representing roughly 60% of the building’s exterior, at best they deliver an R-Value of 4. 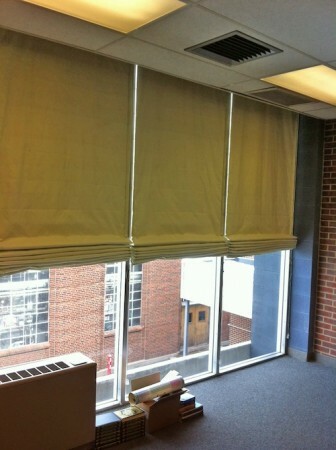 Adding HeatSaver® Thermal Shades could have brought that up to R-12, stopped cold air convection, conduction, and improved interior comfort levels. Hotels and Motels are notorious for having wall mounted heating and air conditioning units located below windows, covered with traditional draperies that direct the conditioned air directly against the glass. HeatSaver® Thermal Shades can be installed under or replace existing window coverings, and thus end the expensive and unnecessary waste. Historically Listed Buildings are often saddled with liabilities they cannot afford to keep. They may have antiquated heating and cooling plants. It will come as a surprise to many that original windows may actually outperform their more expensive counterparts when longevity and ROI is taken into account. Research into Timber Sash Windows is available here and Thermal Performance of Traditional Windows here. HeatSaver® is an option many of those responsible for these buildings may not be aware of. A sample of a Basic Energy Audit showing projected return on investment is available here. Also a sample of a Building Finance Estimate showing returns is available here. Bidding guidelines for Federal, State and Local governments have categories for window treatments, but none that specifically recognize the contribution a well designed, fitted thermal shade can make toward serious energy conservation efforts. These oversights need to be corrected.